...that's what Mary quipped at the monthly Handweavers, Spinners and Dyers guild meeting when Doris stood up for show and tell. And well, it seemed Doris doesn't sleep because her arms were full of gorgeous knits she'd been working on, "just using up my stash" she shrugged. "But Doris, don't you know, she who dies with the biggest stash wins!" Mary exclaimed. Here I was, Hugo asleep in my arms, in a room full of amazingly talented women, needles clicking away, who get together every week to knit and spin and chat. And my, they were so funny! I'd been asked by Hugo's kindy teacher if I'd like to learn to spin. The school has a new spinning wheel and a load of fleece and needed a volunteer to spin it. Always up for a challenge, I simply had to go along to an old church in Battery Point where the guild meet every Thursday morning for a lesson. After the meeting was over. Georgie kindly and patiently explained the ins and outs of the wheel and how to card (comb) the fleece and then spin it into yarn. Lesson over, I headed next door to the store. Oh my. 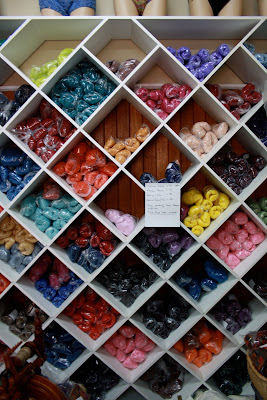 An Aladdin's cave of yarn and wool in all the colours of the rainbow and lovely wooden things. Heavenly really. I loved the row of mannequins dressed in a range of brightly coloured knit bikinis. Although I do love yarn and wish I could knit, I never in a million years thought I'd find myself sitting behind a spinning wheel. But it's very addictive, much easier than knitting and most relaxing. I'm looking forward going back for my next lesson and to see what Doris has been making. And to find out if she really doesn't sleep. Oooh inspiring. I have a spinner that my mother-in-law passed on to me. i have been thinking about going along to one of those meetings sometime, nice to have the inside scoop! the bikinis are great! I've tried knitting but I'm too slow! I just finished my first project, a scarf for Rob after 3 years (not continously obviously!) I just couldn't get motivated particularly over summer! I too don't knit (or crotchet) but would love to learn and spinning sounds like such a relaxing and meditative craft form. Beautiful. I would love to learn how to spin. I had a go when a Spinning Society did a demo at a local library. And I must say that I produced some rather ugly chunky brown wool. But I would love to keep trying one day. Can't wait to see what you make. I have it right - right? Those are WOOLLY bikinis? The ones that capture all the sand, with crotches that sag down to the knees? Sounds like a lovely way to spend some time with women! And how cool is a school with a spinner?!? Lucky boy going to such an awesome kindy! xo m.
I was you a few years ago - going off to learn to spin - wasn' real convinced to start with but now, oh brace yourself and start building the shed for all the fibre you will collect it, it is so addictive and relaxing. enjoy! Oh lucky you!! I'd love to spin! !